Dani Claesges, coordinator, of the Eau Claire School District’s homeless program, shows off donations collected for homeless kids. It’s easy to have the thought that there’s something shameful about being homeless. It’s presented in movies, in TV shows, in news programs, and social talk; that homelessness is a problem for big cities, that “homeless people” are dangerous addicts with filthy habits, that “homeless people” choose their life on the streets, that “homeless people” avoid work by living off donations from others. Dani Claesges knows thousands of people who have experienced homelessness and her story is very different. 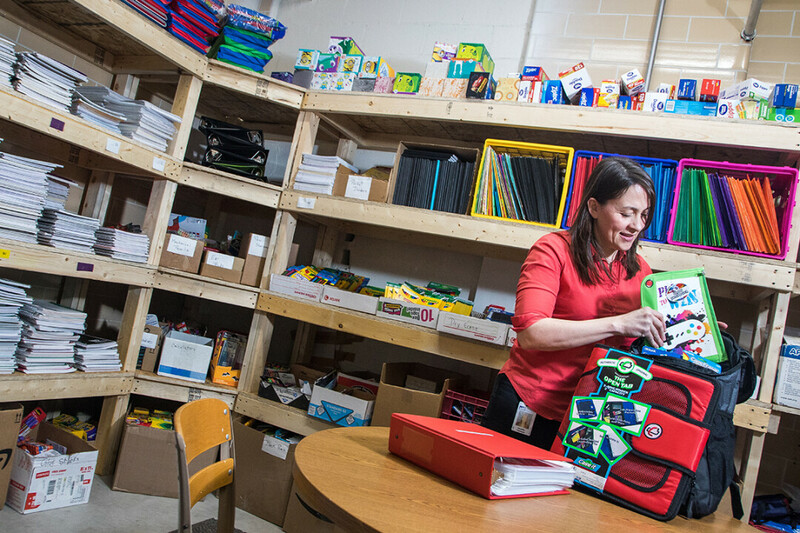 Claesges, the coordinator for the Eau Claire Area School District’s Homeless Program, has been assisting homeless students for more than a decade. The words she uses to describe the families she works with are words like inspiring, thankful, kind, generous, and strong. Child homelessness in Eau Claire is very real, but it is not often visible. In the 2016-17 school year, 369 students found themselves without a permanent home. Homeless students may live at another family’s home because of hardship, in a shelter, in a motel, a tent, a camper, a car, an abandoned building, a park, or other unstable or inadequate housing. The Homeless Program operates out of the school district’s dedication to respect and support the integrity of every student’s education, no matter what their life circumstances. The program offers assistance with school supplies, clothing, hygiene products, transportation, and and other tangible needs. It also provides information and connections to the other support services in the area. Families experiencing the crisis of homelessness are supported by the wider community through shelters, kitchens, the free clinic, closets, and other services. “It definitely is a partnership within the community,” Claesges says. “What helps my job – getting the family out of homelessness as quickly as possible – is for those agencies to be strong and have the support and the funding that they need.” Families getting out of homelessness quickly means that the students can return to focusing on their education instead of the anxiety of their situation. And most of them do get out of homelessness: Claesges says that kids are almost never served for more than one calendar year and 95 percent of the families she works with are only served once. The work of the school district’s Homeless Program and of the other support agencies and organizations in our community depend heavily on donations and volunteer hours. The Homeless Program specifically accepts donations of new or gently used clothing and school supplies, or new hygiene items at the ECASD Board Office building at 500 Main St. in Eau Claire. Monetary donations toward purchasing these items are also welcome, and volunteers are needed to sort supplies and clothing. For more information about how you can help to support families working to get out of homelessness, contact Dani Claesges of the ECASD Homeless Program at (715) 852-3044 or follow them on Facebook to get alerts about specific needs.